Opportunities to eat in a 14th century building – unless you are a chewer of toffees in mediaeval cathedrals – are few and far between. So the prospect of the Hostaria dell’ Orso in Rome was intriguing. Between the Piazza Navona and Tevere and now totally restored, this former inn, hotel, restaurant and (in the Dolce Vita years of the ’50s and ’60s) night club was opened in 2002 by chef Gualtiero Marchesi and entrepreneur Vicenzo Nicastro. Its three floors contain, in ascending order, a piano bar, a restaurant and a discotheque. You will not be surprised to learn that it was the second of these which was of interest to your correspondent. Twenty years or so ago Signor Marchesi was awarded three Michelin stars in his native Milan. But – before your pulse starts to race – I should say at the outset that the food at the Hostaria dell’ Orso is not in that league. Nevertheless, it is straightforward and pleasing. 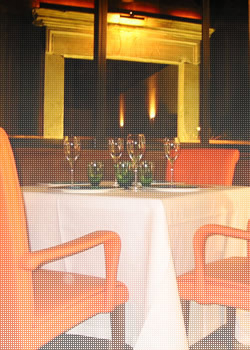 A quartet of four-course set meals is offered, ranging in price from 50 to 78 euros. These are composed of dishes from the carte. Choosing directly from the carte, as I did, will take the price to around 75 euros. I began with seared scallops on lettuce, with pink peppercorns and ginger – accurately cooked, with the scallops’ sweetness contrasting with the bitterness of the lettuce. Next, decent spinach (i.e. green) pasta in the form of large leaves (stracci), covered with a veal sauce, cream and parmesan and then gratinated. Tasty fillet of beef came with a sharp cake of herbs and an intense red wine sauce, and my dinner concluded with a lightened version of tiramisù. My drinking illustrated the truth that in Italy you do not have to pay a fortune in restaurants to enjoy what is poured into your glass. A chardonnay from Lazio had good acidity, and layers of lychees and melons (Calanchi di Vaiano, 2003). It was only 30 euros. And the earthy, pugnacious primitivo from Puglia (Mo & Mo, 2003) was even cheaper – just 23 euros. These bottles were brought to my table by sommelier Daniele Montano. His extensive list is mostly Italian (1999 Sassicaia and Ornellaia are both 270 euros, Mr Gaja’s 1996 Barbaresco is 400 euros), but it also includes some lovely French offerings – like, 1986 Pichon Lalande (810 euros) and 1996 Yquem (632 euros). The waiters wear black tie and, under the direction of maitre d’ Luciano Zanazzo, provide friendly service. I awarded a gold star when I saw that new napkins were provided, if guests left the table. I also approved of the white tablecloths. But what of the mediaeval setting, I hear you cry? Well, my room (there are five) was an enclosed loggia. Through its windows were stone columns with Corinthian capitals. Impressive. My comfortable armchair was in orange leather – a stylish modern touch. I liked less the overhead lighting, which was rather harsh. Tall candles on the tables and dimmed lighting overall would transform the atmosphere. For this is a place in which one wishes to linger – and reflect upon the opportunity to eat in 14th century surroundings. Via del Soldati 25/c, 00186 Rome, Italy.